I discovered this very special glittery manicure here and really wanted to try it out ever since. 1) Find yourself a nail varnish and a topcoat (additionally I always also use a base coat) and paint your nails in the colour + sealer. 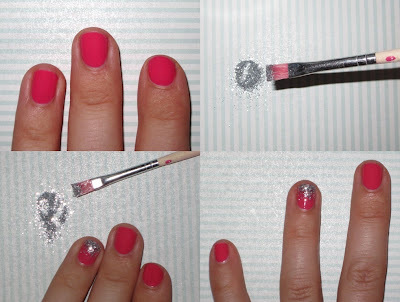 2) Get your glitter and puff some onto a piece of paper. Apply a little more topcoat onto the tip of the glitter nail to-be. 3) Dip a separate brush into the topcoat and then into the glitter and start applying to the glitter nail until you're satisfied. 4) Wait until dried a little and apply a last layer of topcoat. Done!